This piece has been really hard for me to write. I’ve been procrasting it. I wrote it on paper, crumpled it up, and am now here typing it again. It has been awhile since I have shared something on this platform. I shy away from it, because I’ve never intended to be the face of my brand. STUK represents ALL girls and women, not just me. I dig staying more behind the scenes. But, then I thought, is that playing small? This travel experience truly changed my life. It was so profound I felt it had to be shared. It meant so much to me that I had all this anxiety around writing about it. What will people think? What if it’s negatively received? What if it’s not as impactful as I want it to be? I had to quiet my mind. 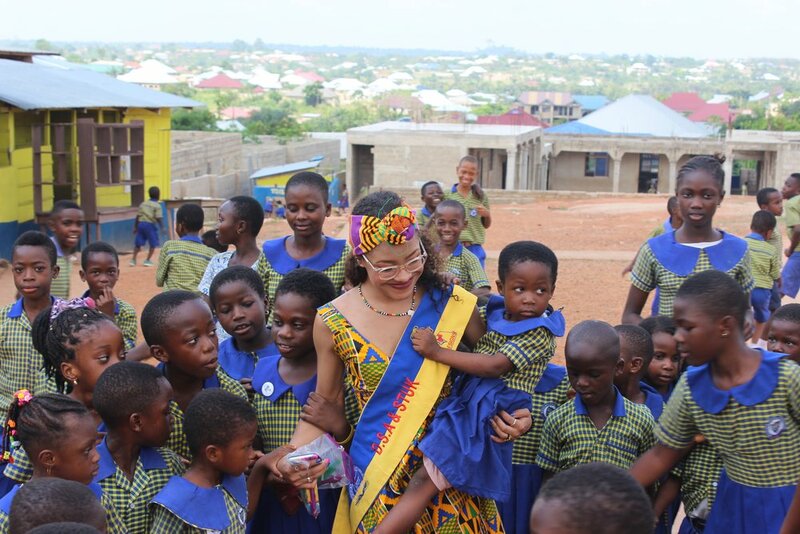 So, here I am showing up to the page, confronting fear and procrastination, and presently writing for you, my story of a life changing and totally manifested trip to Ghana! Where do I even begin? I guess I will start from the beginning. A few months ago I saw an amazing video online of an innovative teacher in Ghana! Her name is Madina Asara and she is 23. She created custom handshakes to greet each one of her students as they walk into class each day! Immediately I thought: “Hey, she gets it!” This teacher embraces her students’ individuality and gives them something unique to celebrate their one of a kind energy! I immediately realized that she understood teaching self-love first. Little did I know that this teacher would soon become like a sister to me, and someone who completely propelled STUK DESIGNS and my own personal evolution to the next level. I reached out to teacher Madina and Diamond State Academy, the school she worked for. She was so excited and wanted to partner with us right away! She then had me reach out to the owner of the school who ended up being her father! Her father lives in Ohio. After one conversation with her father I knew our missions were in complete alignment. He offered to fly me out to Ghana to represent the STUK DESIGNS team. He arranged for my expedited Visa, set me up with a travel agent and said that I could select any dates I wished. They booked my flight after one phone call and within 2 weeks I was off to Ghana. I’ve wanted to travel to Ghana since college. This trip was a direct manifestation that had come to fruition. 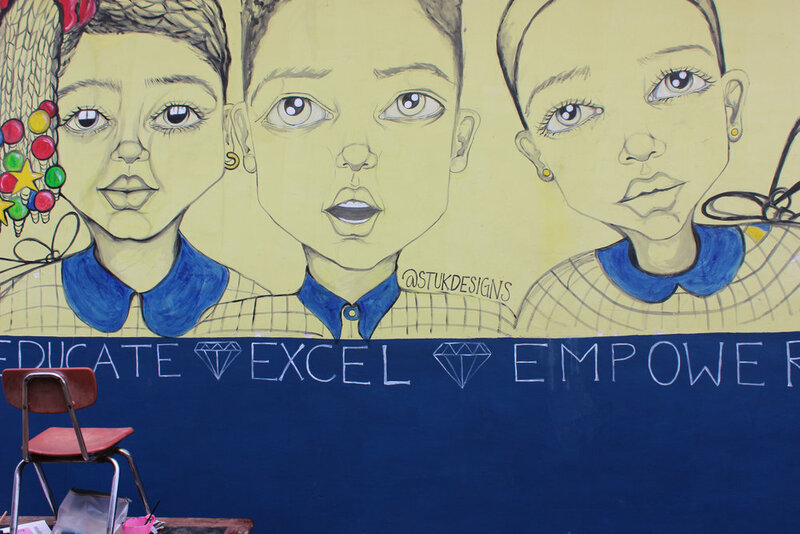 In every vision I’ve written and every dream board I have created, I wrote that the goal of STUK DESIGNS is to reach and change the lives of girls on an international level. 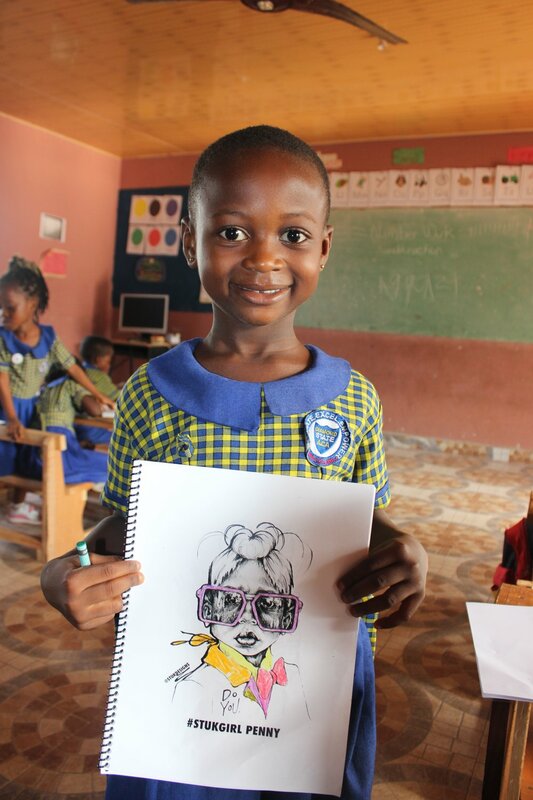 I also wrote that I would go to Africa, give back, create, and teach girls art - and on this trip I did just that! It was surreal, I almost didn’t believe it was really going to happen, and the whole time I was traveling I literally felt like I was dream walking! I didn’t know much about Ghana, but I learned so much history on the trip. Ghana was originally colonized by the British, which is an unfortunate reality, but due to that history everyone speaks English extremely well. Thankfully Ghana gained their independence Mach 6, 1957. During my trip I was welcomed in and hosted by Teacher Madina and her family, in their beautiful home in Kumasi. I flew into Accra (the capital) and they met me at the airport. From there we took a 5 hour bus ride to the more rural and traditional, yet larger city of Kumasi. The Capital, Accra is much more progressive, affluent, and westernized. Accra has a huge international airport and is a tourist hub. I was actually thankful to get a more traditional and raw experience with the school being in the more inland city of Kumasi. The family and everyone at Diamond State Academy was beyond accommodating! Diamond State Academy prepared this immaculate welcoming for me and STUK DESIGNS. Honestly I’ve never felt more like a Queen! It was a true and pure dream! 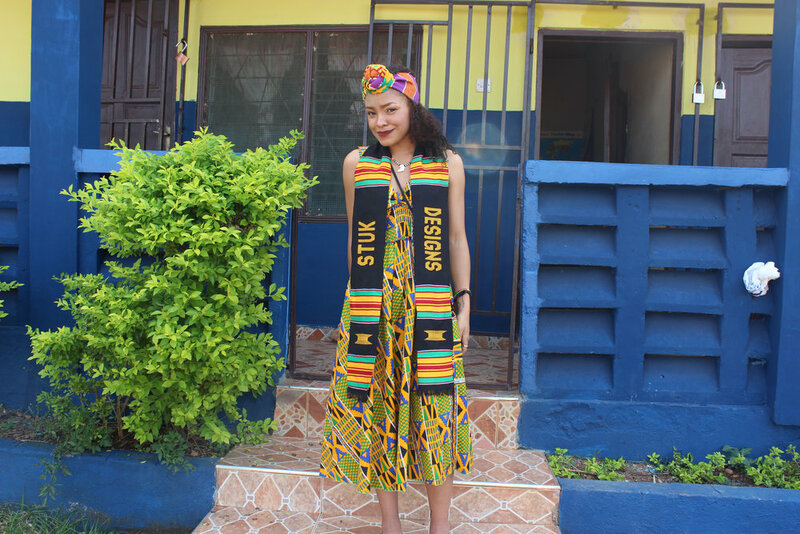 They had custom Kente cloth made with “STUK DESIGNS” and “BRETTE SIMS” printed on them. They also had a sash made with our logo! I was blown away, overwhelmed, and in complete gratitude. This trip taught me so much about human kindness, and the spirit of giving. Angels are all around us. If you believe in good people, you will always be surrounded by them. I had only ever intended for this to be an online partnership. I asked for no pay and in turn they flew me across the world. When you freely give you freely receive. 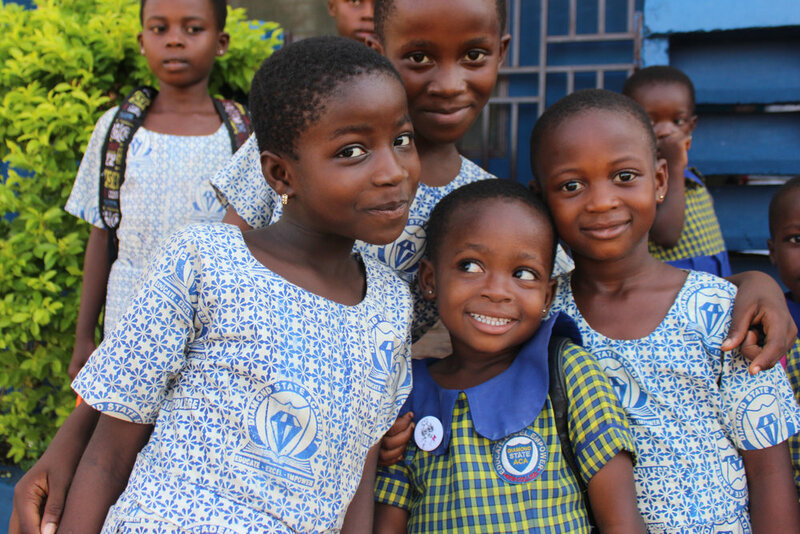 Ghana is embedded with the purity of giving. The family prepared me my own guest room in the house. Every morning, afternoon and evening they cooked traditional Ghanaian foods for me like foo foo and yummy plantain dishes! The days I worked at the school they had the school’s chef and kitchen crew prepare custom meals just for me in the administration office. I felt comfortable, safe and happy the entire two weeks I was there and I honestly didn’t want to leave. Since Kumasi is a more underdeveloped, yet richly traditional city, running water is rare, you cannot drink the tap water. This made me much more conscious about waste and of how precious purified water really is. I honestly could not find wifi my entire trip. Power outages are a norm in Kumasi, which kind of shocked me, and was a hard adjustment. I experienced about 4 when I was there. But after awhile I realized that the family used these power outages in a positive way. When outages happened we would all move out onto the terrace where it was about 85 + degrees and talk, eat, and socialize. It’s amazing how a lack of internet and modern technology can bring people together. 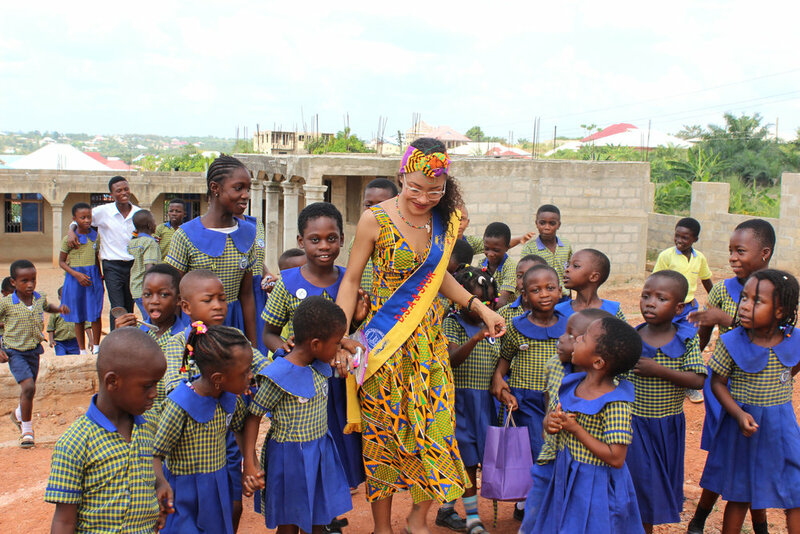 The energy of Ghana is really hard to describe in words – but let me try. My soul was just at absolute peace. The intensely spiritual parts of my being were fed, nourished, and fortified. Living in the States sometimes gets me down. I am far from a materialistic human and what I value most in life are things that cannot be seen. 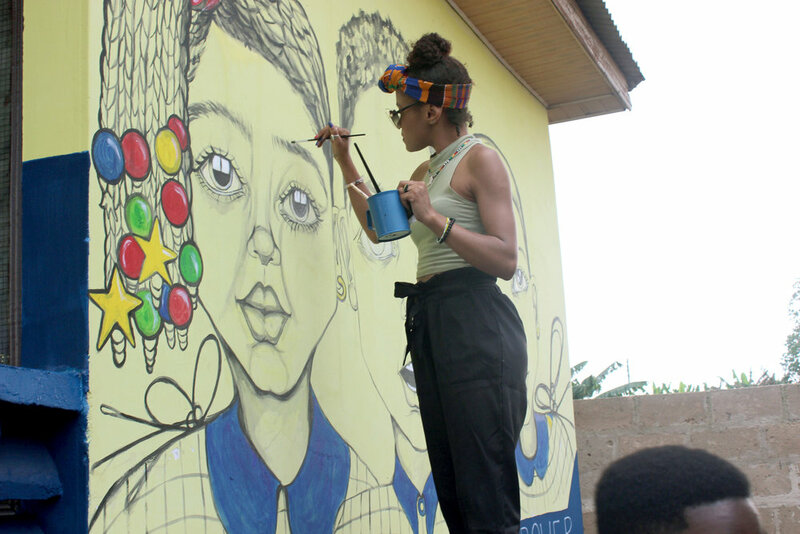 Ghana is rich in all these things; love, beauty, art, community and music, were all around. I just felt “an invisible something” always surrounding me. I never felt anxious, stressed or really even sleepy in the mornings. Everyone’s positive energy was quite contagious. Their community took me in as if I was family, and now I do feel as though I am a part of their family and so is STUK DESIGNS. We are here living for the same purpose and mission to provide resources and love to children in underserved communities. The founder of Diamond State Academy, Mr. Rockson, built the school from the ground up, out of his own pocket, basically with a dollar and a dream. 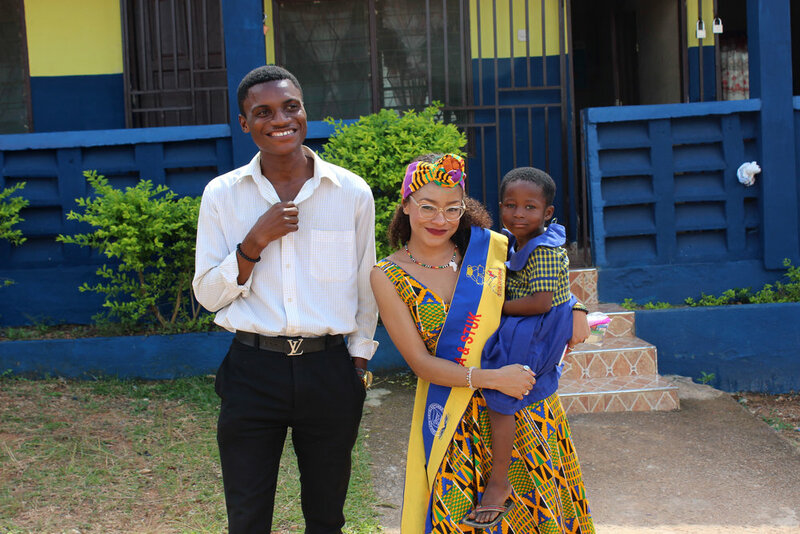 He returns to Ghana for a few months each year to upkeep the school and spends the rest of the year working in America to provide his family and the students at the school with resources and funds that Kumasi, Ghana does not currently offer. The exchange rate in Ghana was super shocking to me! .19 US Cents = 1 Ghanaian dollar or Cedi. I didn’t bring a ton of cash, but it went SO far there! With $200.00 American dollars I received about $1,000.00 Cedi’s (or Ghanaian Dollars). Isn’t that crazy? So I bought kids shoes, art supplies and more! We gifted the girls STUK coloring books, STUK pencils, pens and crayons. Teachers lack resources. Most of them just have flip phones. I don’t think I saw an iphone the whole time in Kumasi. They need textbooks and school supplies. Most of the students used the paper gift bags STUK gave them as book bags until they inevitably broke, because most of them do not have money to buy backpacks or book bags. There is not even an art store in Kumasi. So when I wanted to paint the mural and buy students supplies we had to go to a store like a staples and buy tiny acrylic paints bottles. That was all that was available. Many people in Kumasi have little to no money. But was happiness, joy or presence ever lacking? No. They are the happiest people I have ever met. All the student love to dance and sing and do everyday! Happiness is not what you have, but how you see the world, love yourself and those around you! 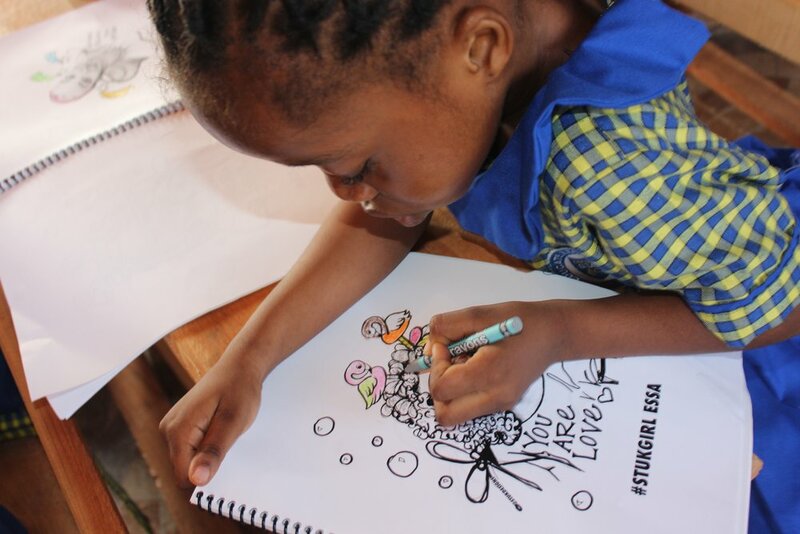 The biggest shock to me, aside from the exchange rate was that when I gifted our 5 year old #STUKGIRLS the coloring books they didn’t quite know what to do with them. Most of them had never colored before. I had to show them each what to do, and how to begin and then they were hooked! 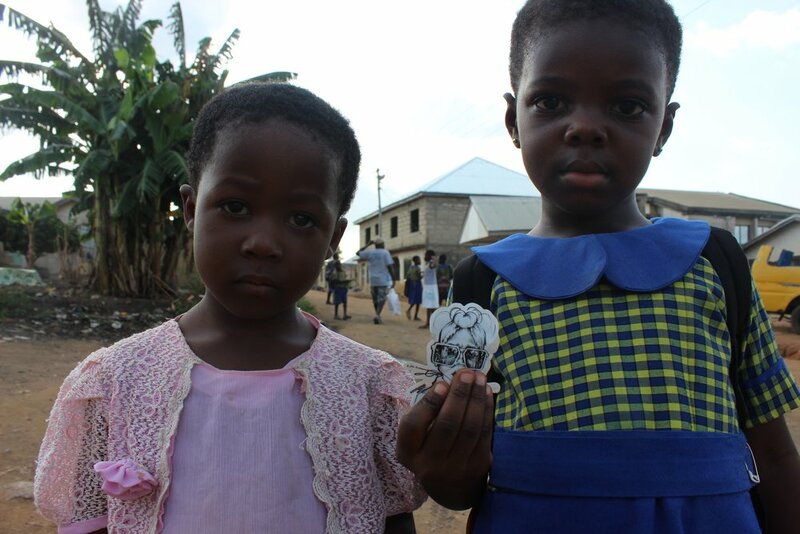 They went crazy for our #STUKGIRL pins, and their first own pencils, and crayons. They finished their coloring books in about 2 days! I also created a large mural in about two days (due to trip time constraints). The kids were so fascinated by the process and it was pretty much the best mural audience a girl could ask for. Ghana is a complete VIBE. It has a purely unique creative energy like no other county I have visited! Colors of buildings are rich and bright and everyone has so much cultural pride. Everyday I was there we would wake up at about 6am and get ready to go to the school. The school has one very old Mercedes van that transports almost all the kids to school. Most people do not have their own cars in Kumasi, so the bus driver has to make many rounds of pickup and drop-off’s because the bus cannot fit all the students, and this is the only mode of transportation for most of the kids. Sometimes the kids have to lap up or stand to make space. They are in deep need of new or additional transportation. When Immauel the super kind hearted, and very funny bus driver would drop us off we walked through beautiful green fields with palm trees and plantain plants, dirt roads, and colorful shacks to get to the school. Immanuel would always play Ghanaian music in the car, which literally sounds like sunshine and I pretty much listen to it now everyday. Most of the kids live in small shack-like buildings with one room and many family members. When the kids cannot afford lunch a certain day or grow out of shoes, or school uniforms they just have to stay home from school. Teacher Madina explained this to me and how frustrating this is, and she expressed to me her desire to make social change in Ghana. It breaks her heart when families cannot provide for their children’s education. 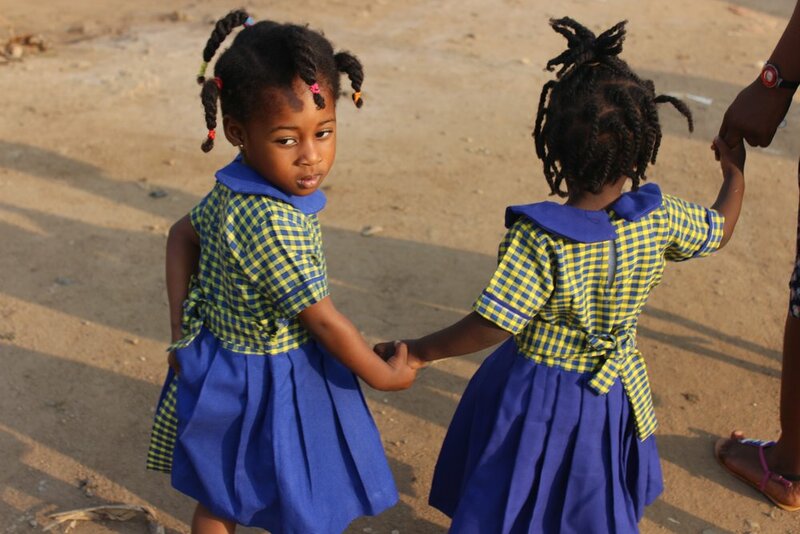 She hates to see girls not in school and will reach into her own pocket to pay for them or wave fee’s when she can. Madina is one of the most selfless humans I have ever met. I immediately knew that the STUK team HAD to make a change to this reality. I became closest to one little girl in particular at the school. The very first day when there were crowds of kids on the school yard, she found me in the middle of the crowd, held my hand and we were inseparable the rest of the trip. Her name is Adowa and she is three. She is a pure light! Most days she struggles to make it to school, due to school fees or affording clothing. She lives in a one room home with 6 siblings. I believe her and her older sister are the only two in school. Everyday she would find me at the beginning of school, or catch me when I was walking to the school and run to me with an open armed hug! One of the days while walking to school, I saw her and her sister playing in the dirt field outside their home with no shoes on, and not in uniform. I learned that Adowa didn’t have any shoes, so she was missing school. This broke my heart, so we went and bought her 3 pairs of shoes over the next few days. I met her mother, who sells really delicious food on the street, and her mother actually asked me to take her. She said that she didn’t have the means to take care of Adowa. While in an ideal world I would have loved to take her home with me, I was just in no position to take a 3 year old and I’m not sure how that would realistically even work. It was hardest to say goodbye to her. She has still been out of school and hardly comes anymore. 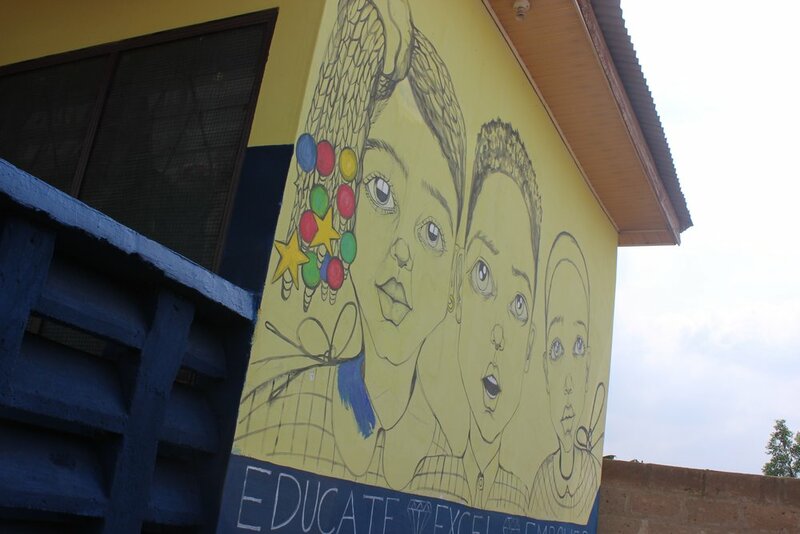 Ghana helped completely connect all the dots within STUK’s mission. If I ever had any doubts before, well now I am 100% positive that STUK will help Adowa and all girls who struggle to make it to school. We are solid in our mission and working everyday to evolve as a company so that we can be in a better position to help! We will share more details as more growth happens. If our mission and my story positively pull at your heartstrings, or deeply moves you, please donate today HERE! The exchange rate is so drastic that even a dollar goes a long way! Phew, I know that was a lot to read, because it was a lot to type haha, but THANK YOU for reading! Thank ANY of you who care enough to read about and invest in our journey! I want to make it clear that I share this because: yes – it was a personal journey I took, but the U in STUK stands for “United”. We are all connected, and we are all here for a limited amount of time in search of purpose! If we can bring women together with our purpose, we are more than thankful! We could not do anything without all of your consistent and passionately positive help! Thank you for being a part of our community and thank you for believing in change! The future is so very female! We love you, but we hope you love yourself more than we ever could! Travel, evolve, connect, shop, give and grow with us!